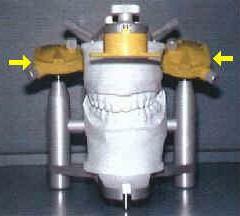 An articulator as a "dental machine" that works as close as practical to the way the mouth works. Dental Models taken with impressions and poured in dental stone are placed on the machine either for examination and diagnosis, or to construct dental appliances. Special records are taken to accurately position the dental models on the articulator. The facebow record is a measurement from the upper teeth to the joints. The centric relation or bite record is a measurement of where the teeth are positioned with the joints positioned correctly before the teeth actually come into contact.